E. pulchellus is small growing cacti with flat bodies and short pale spines. 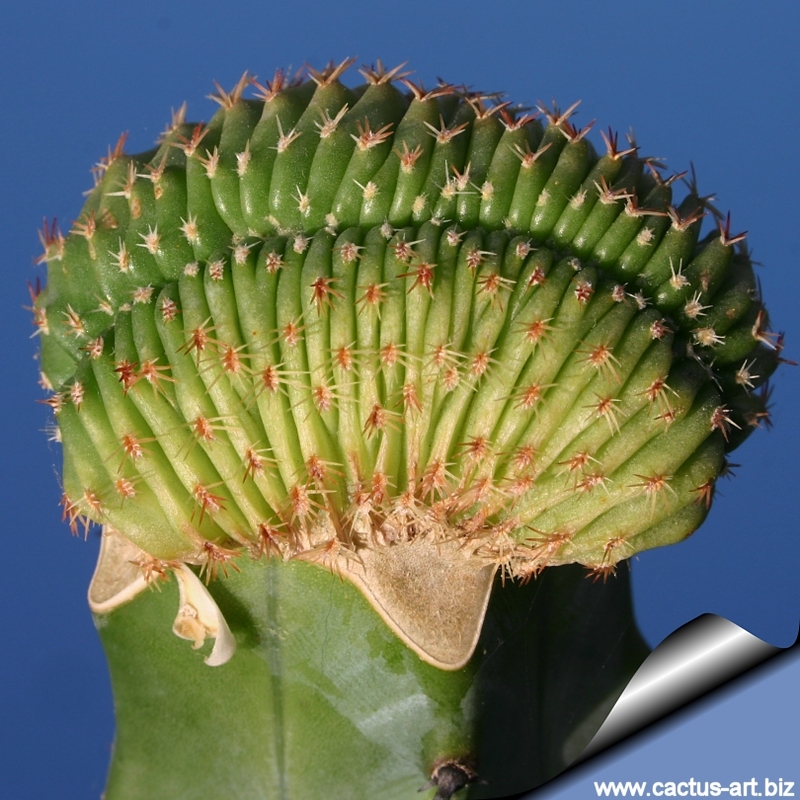 Description: E. pulchellus is a popular solitary or slowly clumping cactus, the standard form of it with flat globular, bluish green stems up to 6 cm, 5-7cm in diameter is very common in cultivation, while the crested form here described is very rare and sometime visible only in specialized collections. E. pulchellus ssp. pulchellus has stems that are 2,5-5 cm thick with 9 to 12 ribs and 3 to 7 inconspicuous spines per areole. The flowers are pink or white. E. pulchellus ssp. acanthosetus has stems that are 2 to 4cm thick with 9 ribs usually and 5 to 8 flailing hairlike spines. The flowers are magenta to white. E. pulchellus ssp. sharpii has darker colored stems in comparison to the other subspecies that are 2 to 6cm thick with 11 to 17 ribs and 7 to 14 spines per areole. The flowers are magenta to white. E. pulchellus ssp. 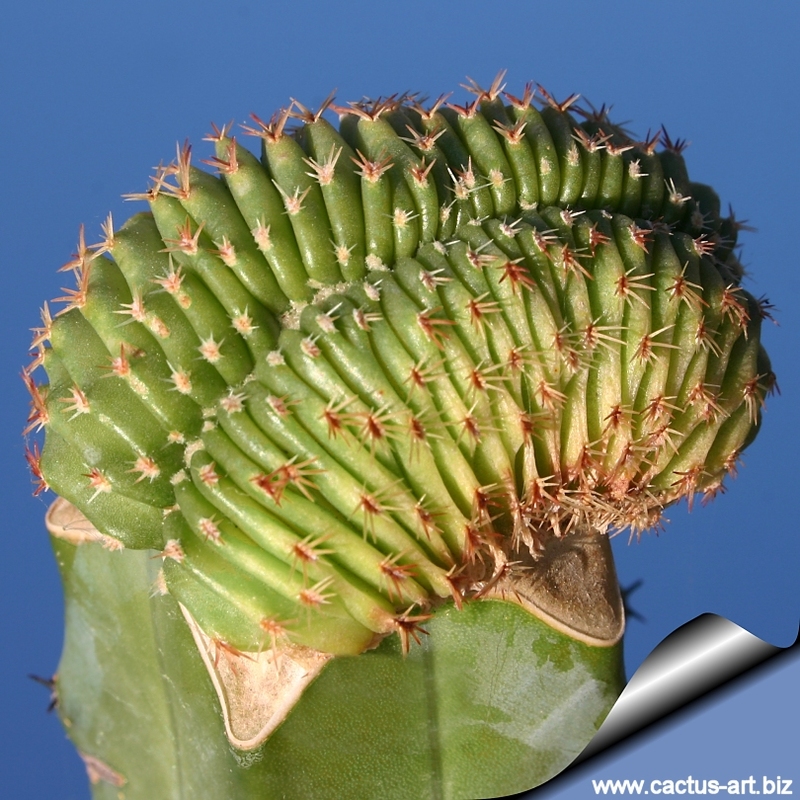 weinbergii has stems that are 5 to 15 cm thick with 14 or 15 ribs and 8 to 11 spines per areole. The pink diurnal flower petals are narrowly acute in shape. E. pulchellus ssp. amoenus has 15 cm stems, 10 to 14 ribs & on the young areoles it has 6 to 8 short spines with the lower spine being the longest. The older areoles are devoid of spines. The flowers are magenta. Ecology: It is a geophyte cactus with a swollen underground storage taproot, in the wild tends to disappear completely in the ground in time of drought. = Echinopsis amoena Dietrich 1844:187-188. Echinopsis pulchella var. flore kermesina Haage ex Förster 1846 pro syn. Echinopsis pulchella var. rosea Labouret 1853 pro syn. Echinocereus amoenus var. aguirre Zehnter & Künzler Catalog nom. nud.